"...Olin has the nicest, most pleasing way of disagreeing with you of anyone I have I ever met. He is one of the real gentlemen." Olin passed away on September 13, 2008 at 100 years young. Click here for more on his leaving and this website's memorial to him. Olin had already made his mark as a designer with his design for Cherokee, the 1930 Class champion in the very competitive Six Meter Class. (Webmaster Note: On September 4, 2008 I visited the Museum of Yachting at Ft Adams in Newport, RI. The curator there is Jay Picotte, owner of Recovery. For an interesting side story on this visit, Cherokee and its indirect impact on our Dolphin 24 story - click here) Olin's future was assured with the design and racing success of the 52' yawl Dorade in 1931. An important connection for Dolphin 24 folks is Dorade was named for a dolphin! (correctly spelled Dorado - we have a couple on our Roster). 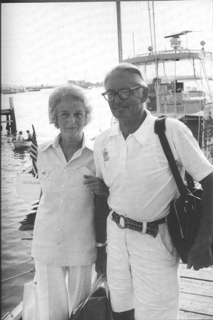 Scuttlebutt News, the Internet newsletter for sailing, had an interesting article by Bruce Knecht about Dorade on the occasion of Olin's 98th birthday. To read this article and see Dorade, click here. 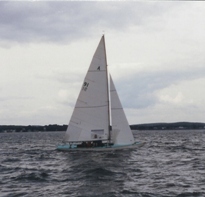 I met Olin 6 times - the first in 1996 when I had just bought Marionette and still had my Atlantic Class sailboat, a 30' classic racing boat designed by Starling Burgess in 1929. I was Secretary of the Class Association and we had invited Olin to speak at our annual dinner meeting. In 1937 Olin had teamed with Starling to design the famous J boat Ranger, sometimes called the most beautiful racing yacht ever built. This connection of Olin to Starling Burgess has special significance to Atlantic owners. 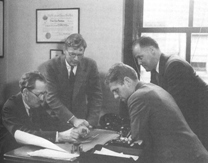 This picture from All This and Sailing Too shows Starling with Olin, Rod and Drake Sparkman reviewing Ranger plans. For a larger image and Ranger's lines, and more on Starling Burgess, click here. Webmaster Note: Speaking of designing beautiful, fast boats Starling Burgess could do it too. His Atlantic, designed in 1929, is right there with the best of them, as these photos of your webmaster's Relish attest. For larger views click here. Ok, back on track. For some reason my wife could not make the afore mentioned dinner so I was assigned the responsibility to 'take care' of Olin. Olin was 89 or 90 then, living in Hanover, NH and made that 4 hr drive by himself on a cold January day in his VW bug. This assignment was made at 6:30 that evening giving me little time to get prepared. For 2 hours Olin and I had dinner conversation together alone at a table in a room with about 120 extremely envious sailboat racers. An opportunity of a lifetime, and I do not remember anything about our conversation!!
" I've always liked the Dolphin's lines". When I decided to go to work on this website, I met Olin for the 5th time. I interviewed him in early February, 2007 at his home in Hanover, NH. Having learned my lesson from my first session with Olin 10 years previously, I asked, and got, his permission to digitally record our conversation. Audio excepts from this interview will available on this site as soon as I can figure out how to do it. 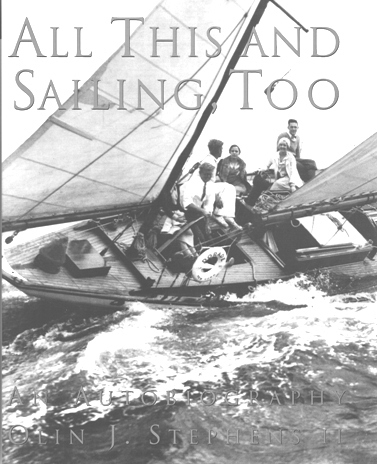 Olin's autobiography, All This and Sailing Too, is a wonderful book, written in Olin's unique and refreshing style. Another excellent book about Olin and his brother Rod is "You are First", by Frank Kinney, a designer who worked 26 years at S&S. He recounts many instances, conversations and situations in his book that help describe the kind of person Olin is. "It is a very difficult problem because, probably in realistic terms, its really an impossible one"....Nevertheless, there are many avenues for improvement..."
It is interesting that the designs that came from S&S are officially S&S designs, not "Olin Stephens" designs. Frank Kinney's 26 years with S&S gave him a good perspective on how the firm operated. He says on page 63 of his book. "Olin is a man who has mastered the art of getting other people to do what he wants in producing boat designs. He is a good administrator with a trained eye for the proper shape of a boat. Competitive, genuinely modest and unassuming, he likes to keep track of how each calculation and each drawing is coming along. ...it is often quite startling to find him at your side having a look at your work. Then, if the lines he sees are pleasing, he says 'That's good Frank, just as you have drawn it'. If not, perhaps he will say 'I would like that sheer line better if the low point were just a hair further aft"
Olin has so many famous winning designs any listing would inevitably overlook many worthy of mention. To anyone who follows the sport just the names of some of these yachts are inspirational - Dorade, Stormy Weather, Baruna, Brilliant, Mustang, Bolero, Kialoa, Ranger, Dora IV, Running Tide, Flyer, Vim, Columbia, Constellation, Intrepid, Courageous, Tenacious/War Baby, to name a few. Close to the top of this or any list would have to be one of his most famous, Finisterre, whose genes are in our Dolphin (click here for why). 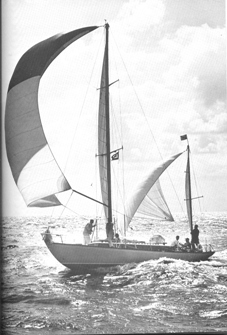 Finisterre was 1st in Class and 1st over all in 3 consecutive Bermuda Races (1956, '58, '60) a feat never equaled since. Her owner, Carleton Mitchell had her built in 1954 by Seth Persson, a legendary wooden boat builder whose small shop was located on the Connecticut River in Old Saybrook, CT.
Olin modestly credits the skill and experience of her owner and skipper, and her loyal hard driving crew, for this record. And, he notes the modicum of luck required for any Bermuda Race winner. The fact is that this rather small, 38' LOA, beamy, bronze centerboard yawl combined speed (especially in light air), seaworthiness and comfort, was a great racing boat in all conditions, and in her owner's words "..it was as a cruising boat that I felt Finisterre was truly a success." She was comfortable, easy to sail shorthanded, her shallow draft made gunk holing possible. She was more than just one more good boat off the drafting tables at S&S. S&S's achievements are a star crossed combination of factors - Olin's intuitive technical and leadership skills, his integrity and personality, his father's and Drake Sparkman's belief in him as young designer, his brother's unqualified support and technical contributions, and a culture of hard work and mutual respect among S&S team members. "...in addition to ability and hard work, the fact is I have never seen the kind of unflagging mutual respect year in and year out that existed between the Stephenses and my father. 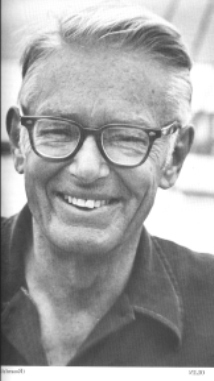 Dad had the deepest kind of respect for Olin's personal integrity and his ability, and Rod's energy and unequalled capability for hard work and thoroughness." There are many, many more examples that illuminate Olin Stephens to us. Somehow, this picture from Frank Kinney's book "You are First" conveys the mutual respect, integrity and ability that the Stephens brothers had and the influential role their father played in their lives. Mr. Stephens supported both Rod's and Olin's desire to drop out of college and start working in the profession and sport they loved. He 'commissioned' the design of Dorade by Olin and then was one of the crew with Rod when Olin skippered Dorade to win the Transatlantic race in 1931. He was behind the scenes advising and helping the new S&S firm. One cannot help but see the sterling qualities that the Stephens brothers demonstrated over the years, had their genesis in their father. 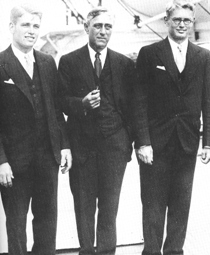 The role of Olin's brother Rod (at left in the picture), in both Sparkman & Stephens' and in Olin's success, is often overlooked. S&S's reputation for quality, durability and performance are in large part due to his skill and untiring efforts. Olin, in his autobiography, All This and Sailing Too Olin says this about his brother who came to work at S&S in 1935.
" .......This was our biggest step toward a happy and successful team. Older readers will need no reminder of Rod's importance to our firm or to my life. He enjoyed the recognition that his abilities brought. But it would not be right to think first of his accomplishments, which are a matter of record. I prefer to focus on his attitude as brother and partner. It was unique. I fear he never realized how incomplete we would have been without him.....He brought the authority of his knowledge, his accomplishments, and his integrity as a sailor and a person to everything he did. Rod was the complete seaman in his understanding of the sea and boats and the relation between the two....His guidance was often in the details, giving advice as to what would work and what would not. Rod knew I might be too ready to accept a client's wishful, unrealistic demands, and he did not fail to point out negative factors when the owner's heart had been set on details or structures he could not approve. In such cases there was no compromise....In the wide world of boatbuilding, here and abroad, he was respected, everywhere and always." Click here to go to Rod.